Celebrities, just like any woman, make it a point to step out of their houses clad with poise and an invincible aura. And celebrities who get engaged or are engaged don’t lag behind in doing a tiny show off every now and then. 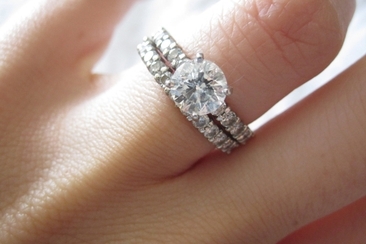 And here we got 20 elegant celebrity engagement rings people often talk about . 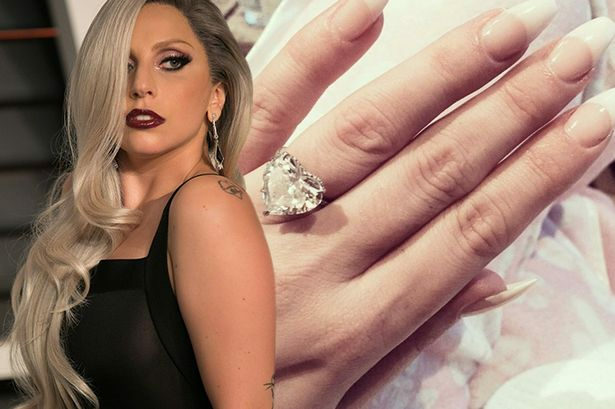 For celebs like Lady Gaga, rings are a priceless piece of possession which is sorted out by their fiancé to make them look paramount. Her ring is approximately a 6-carat splendor solitaire with diamonds down the side making it a heart shaped beauty. This colorless romantic bling is a further proof for Kinney’s love for her. Angelina Jolie is yet another boom bang star who has framed a really gorgeous ring for herself that was claimed to be personally designed by her fiancé and now her husband, Brad Pitt, along with a private jeweler. This 16 carat ring is believed to have an equally giant price tag as well. Being gorgeous and yet confident at the same time is what possibly only Beyonce can do. 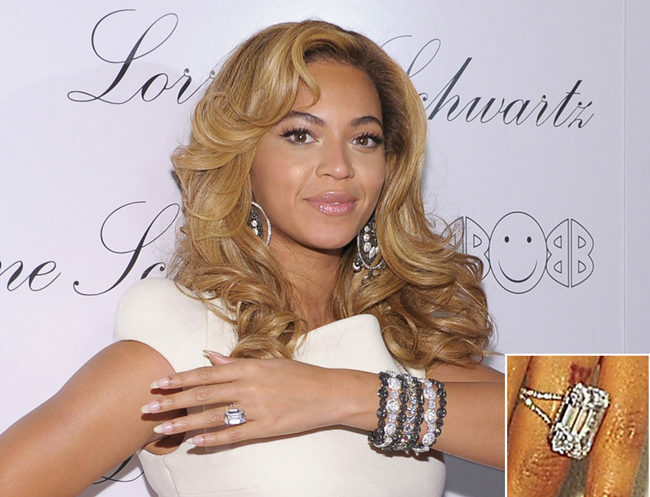 She knows the fashion in and out, so does her husband Jay Z, who bought her an 18 carat unblemished diamond that suits her persona. The emerald cut still dazzles along around her finger. 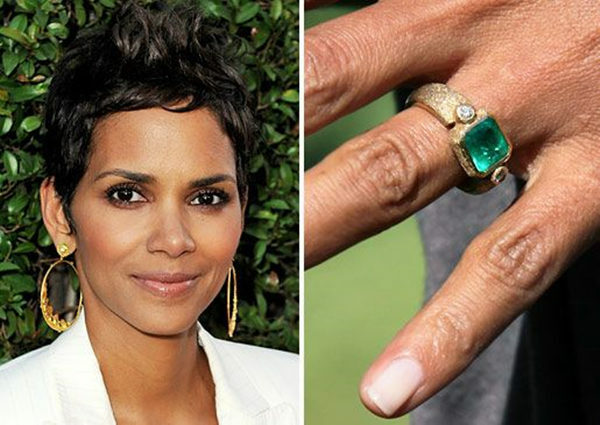 With an antique and art Deco look, Halle Berry dons a green emerald which was set within a platinum base. Her beau Oliver chose a distinct emerald as he wanted significance in this romantic gesture of his. It was a head turner when Jessica Simpson wore an oval shaped 4-carat ruby ring which has two diamond wings. Eric selected this piece really carefully, I suppose. Ladies show off their celebrity engagement rings. Kim Kardarshian proves everyday about how lucky she is to be Kanye’s dear wife while showing off her engagement ring. Its’ a perfect cushion cut type 2A diamond. It’s flawless and it’s an awesome 15 carat D-stone! Now, we know why we should all vouch for a fairy tale love story. Jenny McCarthy is yet another lucky girl to be popped by “Will you marry me?” question. A 10 carat yellow stunner was her proud, featuring a white gold band and a yellow sapphire. 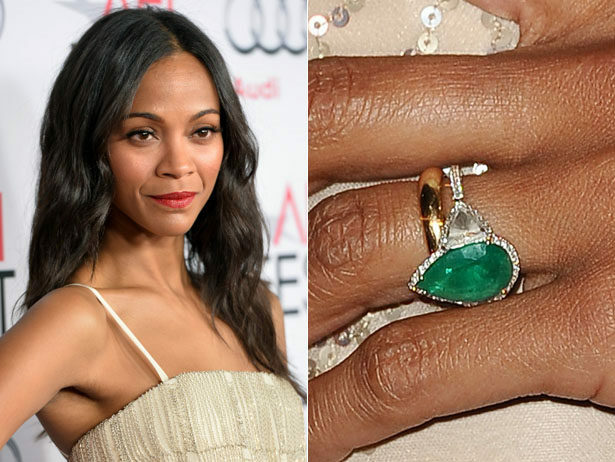 Zoe Saldana was given a tear shaped green emerald ring by her beau Marco. She wears this thin diamond covered ring set in a gold setting, in every red carpet event. Lucky girl, long way to go! 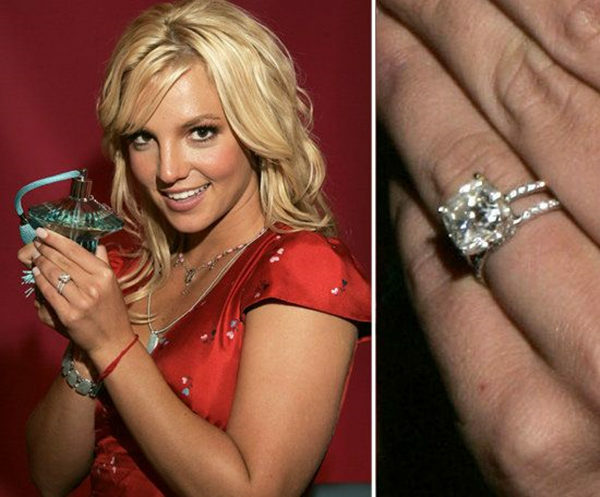 Britney Spears wore a proud 3.5 carat diamond with a sparkler, round and perfect mini crown. The eternity band had 90 diamonds and a giant stone. 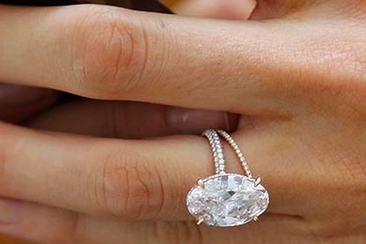 Celebrity engagement rings mean love, commitment and compassion. Elizabeth Hurley is a star in her own sense. She makes a style statement with her clothing, footwear and acting, of course, how can her engagement ring not make a style statement! It is a nine carat blue sapphire and uncut 2 carat diamond. A platinum setting locks them absolutely well. Being her birthstone, sapphire is just an apt choice Warne made. Gorgeous Olivia Wilde's 6 carat diamond has a wreath of emeralds holding around. The pious color of this engagement ring matches her eyes, giving an aqua feel. This is not a deep green color, but has a deep meaning because of its vintage connection. 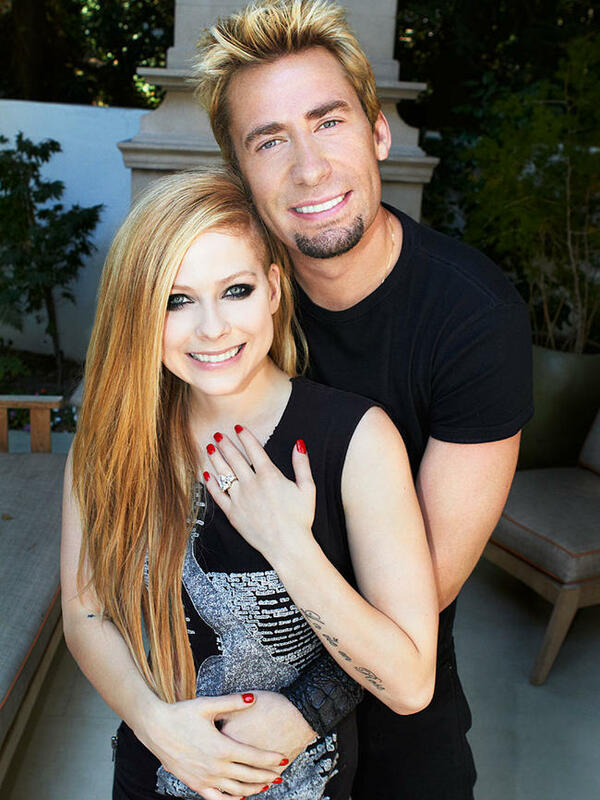 Avril has crazy fans and her beau Chad Kroeger showed a crazy act when he proposed her with this 14 carat pear shaped diamond ecstasy. 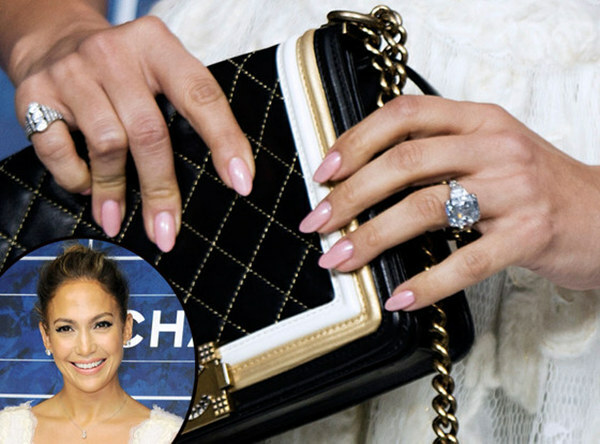 This light blue sparkler used to rest on our JLo’s important finger till 2014, coming from Marc Anthony. This beautiful 8.5 carat ring was too impressively fit for her. Perrie Edwards was given a whooping 2.5 carat gigantic diamond from Zayn Malik. The unique design was a classical artistic trilogy setting. It has a one carat center diamond along with three quarter ones on either side. Celebrity engagement ringsprove the worship bestowed upon the ladies by their loves. Inspired by Kate Moss’ idol Zelda, her fiancé Jamie Hince hunt the vintage styled ring down from her diary notes. This 3 carat diamond solitaire has its own story behind his love. It has been a rarely special piece for Kate, thanks to Jamie for his efforts. Blake Lively, the lovely girl of our Ryan Reynolds, got a light pink oval shaped 12 carat trinket diamond, which is set in a rose gold ring. Caught within the love of platinum with oval shaped 1 carat centre diamond, this beloved setting of tiffany is timeless. Mila Kunis gives it a stunning look as it was a special Kutcher selection. Katie Holmes’ rose gold ring, with a 5 carat diamond instilled within the pure gold setting, bore so much importance because it was given by the heart throb Tom Cruise on Eifel Tower. 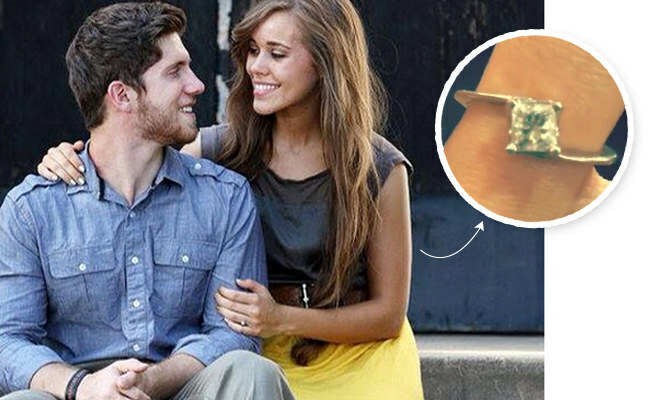 Jessa Duggar hit the fame alarm after 19 Kids and Counting. When she said, “I do” to Ben Seewald, he made her wear this 0.75 carat center diamond ring with platinum setting, making it look simple and even more stunning. 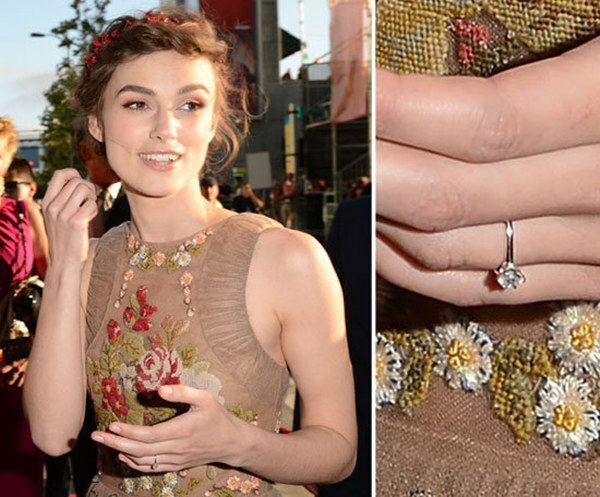 Keira Knightley just got even more attractive when she was given a 2 carat brilliant cut diamond. She wears it in all occasions. That's how these celebrities flaunt their celebrity engagement rings. We know several famous breakup couples who get back together later. 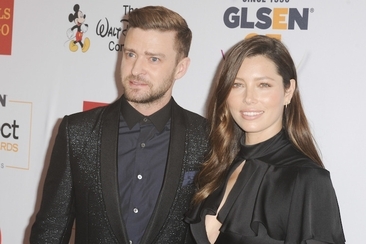 If you need a little hope that you can make a relationship work again, here's a list of celebrities who did that. Trying to recall someone of the most iconic celebrity couples? Here is our list of the top celebrity weddings of all time and what you may want to know about your favorite superstars. 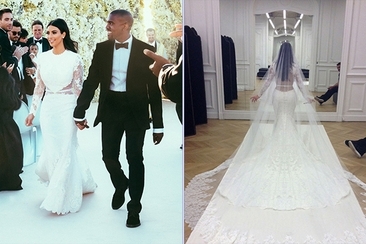 Here we have compiled the list of the best celebrity wedding dresses, conventional, non-conventional, and all that you would love to know. Keep reading to get inspired. 2016 has had an exciting start with all that romancing and cozying up. Let’ see which stars make the 7 hottest celebrity couples 2016 and see if you have guessed right.